The Metro MY2030-34BL three-level utility cart has plastic shelves that resist corrosion, bending, and denting. These shelves are black and together hold 400 pounds. Marine ledges on the perimeter of the shelves keep items contained and prevent leaks from reaching the floor. A utility tray in the top shelf enables operators to hold and organize small items, and the handle near it provides comfort when moving. Non-marking swivel casters on the Metro MY2030-34BL polymer utility cart make it easy to maneuver through relatively tight spaces. 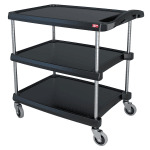 You can read more about utility carts and other popular cart types in this carts buyers' guide.